It is finally happening. After much anticipation, I believe we are now truly entering a new chapter in footwear design. For several decades, we have been caught in the retro era, a regurgitation of the past. Now, design is moving into the future and embracing a style that is truly its own, one that reflects modern design technologies and aesthetics. As a creative director, I am constantly trying to envision the future. My job is found in the ability to craft a perspective for what will be relevant and influential several years from now – so that the concepts that I am developing today will be successful when they go to market. Some of the ways in which I find inspiration are through reading. For short-term trend forecasting, I find that the magazine, View, provides great insight and I usually end up reading it from cover to cover as soon as it lands on my desk. One of the most profound books I have read that has influenced my design direction since the 1980’s, is Future Shock by Alvin Toffler. This book has proven to stand the test of time, successfully articulating how human behavior is changing with the advent of technology. Particularly, Future Shock calls attention to the first 15 years of the new millennium as a time for reflection that the author refers to as “the quilting effect”. Toffler predicted that design trends would take ideas and concepts from previous decades and re-visit them in the early part of the millennium. This was evident in the retro trend that influenced footwear with models gaining popularity such as the Dunk, Converse All-Stars, Vans Slip Ons, and Adidas’ Stan Smith. Now, after this period of reflection, we are embracing the future and pioneering our way forward. I feel very strongly that we are at this inflection point and believe that many brands are in for a real disruption if they don’t make moves to adopt these new futuristic design ascetics. The ideology of this trend is centered around several aspects, one of which is that for athletic footwear, performance is assumed. What I mean is that consumers have an expectation that footwear meets a base standard of comfort, functionality, and usability. Footwear technology has reached a point of maturity were the technical know-how, materials, and development practices are so well refined that there is no excuse to producing product that does not meet such standards. No longer are performance features seen as key selling points. Similarly, the automotive industry has reached this same level of inferred performance in most vehicles for over a decade now. For the everyday consumer, purchasing a run-of-the-mill car, horsepower, suspension type, and brake systems are hardly considered. In fact, such components are de-emphasized by use of the plastic covers blanketing the top of the engine compartment. This aspect of design is seen across many industries. As consumers become more acquainted with the comfortable aspects of athletic footwear, they will want those attributes to carry over to other categories of shoes. I feel that the athleisure trend is here to stay, and certain characteristics will be fused with many other product types. A present day example is the Cole Haan Zerogrand Wingtip. The second aspect of this future trend is that people are most compelled by powerful design. For me, this means a design is recognizably associated with a given brand and its particular aesthetic. No longer is having a large logo on on a product acceptable in the consumer’s mind. For them, it detracts from one’s style. Lastly, great design is versatile and adaptive. The product must be functional in many situations and environments. Millennials view multi-purpose products as valuable. One thing that most people might not know about me is that I conduct my own micro-studies. These are very particular observations around a central theme. As of recently, I have been really interested in learning about mainstream trends of millennials for a new project that I am working on and have found that airports provide a unique insight into footwear. Why airports? Well, people traveling are forced to make a specific decision with regards to their footwear. Though they might have many pairs of shoes at home they have to decide on a single pair to wear when traveling. When faced with such a decision, people tend to pick their favorite pair – shoes that are comfortable yet versatile. Something that can match with a week’s worth of outfits. The results of my personal study revealed that our top shoe of 2015 was indeed a favorite of many others, the Yeezy by Adidas. 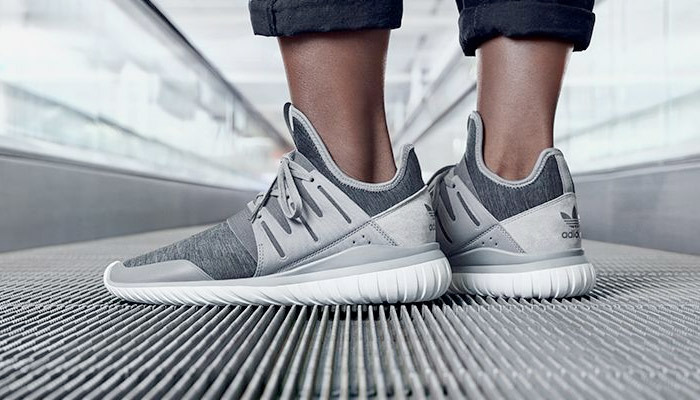 Well to be more realistic, it’s the Yeezy’s sister shoe – the Tubular. his shoe is the benchmark for the future, and has proven to be a disruptor. Yes, the Roshe by Nike might have started this trend, but certainly the Yeezy stands out on its own. What’s most interesting about both examples is how they de-emphasize the logo (only relevant for the flooded models of the Roshe). Instead of relying on brand recognition, these shoes rely on distinct design cues allowing them to stand on their own. Additionally, these shoes offer versatility, providing the ability to function as an athletic shoe, but still be appropriate for any casual social engagement. I am looking forward to the further development of the unique style that we are beginning to pioneer. In an industry as fast-paced as footwear, it is challenging to stay ahead of the curve, but is why I love it so much. I am constantly creating. If you haven’t already, please Subscribe to our newsletter. Also, if we earned it please share!